Sloane Stephens, Ashleigh Barty and Diego Schwartzman also advance to the next round at the Australian Open. Greek fans and their flags were out in full force on Court 3 in support of No. 14 seed Stefanos Tsitsipas, the reigning Next Gen ATP champion, and up-and-coming No. 41 Maria Sakkari, during Day 3 day session action at the Australian Open in Melbourne on Wednesday. Talk about scheduling karma. The fans created an incredible atmosphere, first for Tsitsipas, who played Serbian qualifier Viktor Troicki, and later for Sakkari against Australian qualifier Astra Sharma. There were supportive banners on display throughout the intimate outer court for both Tsitsipas and Sakkari, who earlier this month represented Greece in the Hopman Cup. One of them read “Stefanos the Great”, and the Greek fans shouted supportive Davis Cup-like chants between every point of the 2 hour and 40 minute Tsitsipas-Troicki encounter. They maintained their enthusiasm during Sakkari’s much briefer, 65-minute match, too. 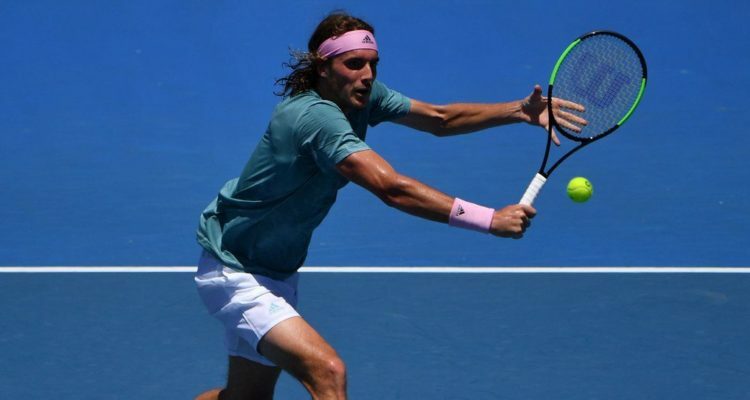 The 20-year-old Tsitsipas thrived on the support he received as he won his second-round match against the veteran Troicki, 6-3, 2-6, 6-2, 7-5, in back of 14 service aces and 53 winners. He advanced to play No. 19 seed Nikoloz Basilashvili of Georgia, who beat Italian qualifier Stefano Travaglia, 3-6, 6-3, 3-6, 6-4, 6-3. Then, it was the unseeded Sakkari’s turn to shine and she won easily over Sharma, 6-1, 6-4. According to one eye witness, even the 201st-ranked Troicki gave a thumbs up to the chanting Greeks as he exited Court 3 after the match ended. Also advancing on the men’s side were No. 18 seed Diego Schwartzman of Argentina, who went the distance against unseeded American Denis Kudla, winning 6-4, 7-5, 3-6, 6-7 (6), 6-4, and unseeded Tomas Berdych of the Czech Republic, who sprinted past Robin Haase of the Netherlands, 6-1, 6-3, 6-3. The 57th-ranked Berdych has dropped just 15 games in his first two rounds. Meanwhile, No. 5 seed Sloane Stephens of the United States moved into the third round with a 6-3, 6-1 win over No. 65 Timea Babos of Hungary on Rod Laver Arena. Stephens, the 2017 U.S. Open champion, generated 23 break-point opportunities and converted five of them against Babos, her former doubles partner with whom she won three junior slams (French Open, Wimbledon, U.S. Open) in 2010, during their 1 hour and 35 minute match. She finished with 15 winners against the Hungarian, who committed 44 unforced errors. After gaining her first win at the Australian Open in five years on Monday against fellow American Taylor Townsend, Stephens now has strung together consecutive victories and looks headed in the right direction. Next, she will face No. 31 seed Petra Martic of Croatia, who beat 67th-ranked Marketa Vondrousova of the Czech Republic, 6-4, 7-5. Also advancing on the women’s side: No. 15 Ashleigh Barty of Australia won the last five games of her second-round match against Yafan Wang of China on Rod Laver Arena to advance with a 6-2, 6-3 win; No. 19 seed Caroline Garcia of France defeated Australian wild card Zoe Hives, 6-3, 6-3; and unseeded Amanda Anisimova of the United States upset No. 24 Lesia Tsurenko of Ukraine, 6-0, 6-2. After World No. 1 Simona Halep came back to beat No. 71 Kaia Kanepi of Estonia, 6-7 (2), 6-4, 6-2, on Margaret Court Arena Tuesday night, launching her bid toward winning a first Australian Open title and second Grand Slam crown overall, it put to rest any lingering doubt many had about the Romanian’s ability to fight – and win. The victory snapped Halep’s five-match losing streak, which included a first-round defeat against Kanepi at last year’s U.S. Open. Next, Halep faces upstart Sofia Kenin of the United States, ranked 56th, who last week won the WTA Hobart International. Looking ahead, Halep could face unseeded Venus Williams in the third round and 2017 Australian Open winner Serena Williams, seeded 16th, in the fourth round. Last summer, Caroline Wozniacki learned she had rheumatoid arthritis, a condition linked to immune system dysfunction. While the 28-year-old from Denmark waited until the end of the WTA Finals in Singapore to go public with her condition – “I didn’t want to give anyone the edge” – her diagnosis required her to completely change her fitness routine and match preparation. Now, there would be more massages, more stretching, more rest time, as well as less sugar, less jogging – even less tennis. After winning the Australian Open last year, her first major, the rest of Wozniacki’s 2018 season was very much up and down. She won titles at Eastbourne and Beijing, which gave her confidence, but suffered a pair of major setbacks in the second round at both Wimbledon and the U.S. Open. Her season also included a last-moment withdrawal in Washington, a first-round loss in Montreal, and a first-set retirement in Cincinnati. Her maladies ran the gamut from painful knees to influenza. It was while Wozniacki was in New York for the U.S. Open that she finally received a proper diagnosis for her condition. Now, as the No. 3 seed Wozniacki attempts to defend her first Grand Slam crown, which she won by outlasting World No. 1 Simona Halep of Romania here last year, she’s going the extra effort. Her title defense began on Monday with a 6-3, 6-4 victory over No. 51 Alison Van Uytvanck of Belgium on Rod Laver Arena that tested her speed and stamina. On Wednesday, she was scheduled to face No. 75 Johanna Larson of Sweden in the second round on Margaret Court Arena. Match by match, Wozniacki is learning and proving she can live a normal life, both on and off the court. On Monday, when No. 10 seed John Isner and qualifier Reilly Opelka, both from the United States, faced off on Court 8, it was believed to be the tallest match in Grand Slam history – a battle of human skyscrapers. Isner stands 6 feet 10 inches while Opelka is 7 feet tall – in his socks – despite being officially listed as 6 feet 11 inches. During their 2 hour and 58 minute match, their average rally lasted two shots. Isner fired 47 service aces while Opelka slammed 40. The 97th-ranked Opelka, a winner of two ATP Challenger titles last year that enabled him to break into the Top 100, prevailed over Isner, 7-6 (4), 7-6 (6), 6-7 (4), 7-6 (5). According to British tennis writer Simon Cambers, writing for The Herald in Scotland, “Andy Murray is leaning towards having another hip operations sooner rather than later to improve his quality of life and potentially extend his career. “This in the knowledge he recognizes that going under the knife would risk a possible swan song at Wimbledon this summer. “After his drama-filled exit from the Australian Open, Murray said he faced a dilemma; to take four months off and just play Wimbledon, or to go for surgery now and see how well he covers. “Murray is heading home today and plans to speak with his team and his family before making a final decision. This entry was posted in Australian Open, Grand Slam and tagged Australian Open, Grand Slam, Melbourne, Stefanos Tsitsipas.